Adrian Burton of South East Workwear, AKA Ask Ady the Workwear Reviewer, provides some all important advice on how to win those workwear contracts. For more of Ady’s advice head over to www.askady.com. Winning a workwear contract can be difficult at the best of times, but these days the market place is becoming more and more competitive and we are seeing the need to bring something else to the table to aid us to win the work. Our own personal business model we have opted to stay with is our showroom and trade counter offering a personal service and great advice to the end users. We have also run successful website businesses, but with this sort of business brings its own host of problems, from sizing of garments, returns, interpretation of what the end results will be etc. The big boys out there who run these types of businesses do it exceptionally well, however the smaller guys who think they can make it in the market place by selling cheap, by running from low overhead industrial units or even from home, and not having the experience to advise on the correct products, are giving our industry a bad name. When we started 25 years ago the industry was a lot easier, less brands of choice and the so called ‘premium brand’ products were not yet invented. We sold Dickies and Castle Clothing and still do now, as well as most popular brands. However, these guys have always stayed consistent in their quality and price point enabling us to offer great products at exceptional value. Winning a contract nowadays is a lot more than just picking a few products that look good together. There are so many factors to consider when putting your quote together. For the first instance the price really isn’t a factor for my sales team. Firstly let’s understand the basic requirements, what job are your customers doing has to be the first question. 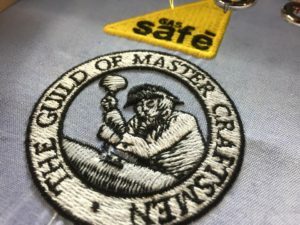 We get guys come into our shop, they might start off saying they bought workwear online last year and the trousers or tops were rubbish and fell apart in no time; to be honest most products these days are good quality regardless of the brand, anyone investing into a production run will not want to end up with a product they cannot sell. We have products produced overseas quite frequently and there is no excuse for getting a poor-quality product, make sure you always get samples and sign them off. The fundamental error for these guys was originally thinking a product selected from a website will just do the job, after all a polo shirt is a polo shirt right? But offering a brand name polo shirt might not be the answer to winning the work, the price might be a put off and unless you can really sell the functionality, features and benefits, you will just scare off the customer. The next consideration should be the logo, what process do they want? Print or embroidery? Or a mixture of both? Here you then get people saying ‘I want embroidery, it’s better isn’t it? It doesn’t crack or wash off’. Well that was true, but taking on a large job to run embroidered T shirts with a big logo on the rear of the tops is going to kill your production times, not to mention machining problems with thinner garments and frustrated staff. Price this carefully if you are going to take this on, your embroidery costs will be more than the money you will make on the job. Some jobs are best to leave to someone else. Another great ask is, ‘I want both sleeves logoed, left breast, my staff name on the right and a rear website, phone number, email address’ and anything else he can think of. This is a dead job; price high and hope they will go somewhere else. Most of these customers demand the lowest price, with a promise of all the work in the world, they will also take up all your time, and the result, they won’t be happy. I have seen them so many times in the last 25 years doing this, you must quote high, you will probably need to redo something or give them something back. Kill me! So, what about printing the garments? With advances in direct to garment printing machines and new materials, printing is great again. My guys can kick the work out of the DTGs and love them; just remember the pretreatment process is a pain in the bum still on dark coloured tops unless you have the money for a Kornit, but DTGs will open a new revenue stream for you. DTGs can now offer low or zero set up costs to the customer unlike screen printing, also having the flexibility to run small runs at competitive prices. 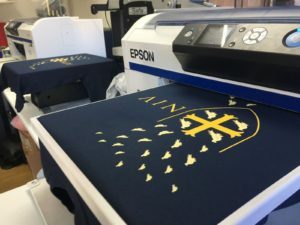 The prints last a long time, cut production times over large rear embroideries and offer great alternatives to complicated and colourful designs, so sell the benefits and make a few quid on these jobs while you still can. If the garments required are waterproof jackets, then you might also want to keep the job to printing. 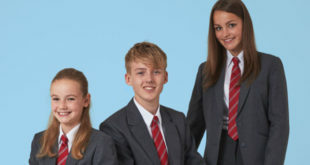 Check the garment material make up, also the process required to effectively reproduce the customer’s logo to the garment and to ensure that you get the correct material to keep the logo looking good for a long time. Also printing will make sure you don’t reduce the waterproof integrity of the garment too. Finally, back to the job and quoting the right garments. First off, if the job is particularly tough, then maybe the garments getting the most abuse is where you need to spend the time selling the features, all good premium brands will offer a guarantee of some sort so use this to your advantage. Also remember that wash cycles will increase with a better brand too, selling a cheap high vis jacket might only last half as long before the fluorescent value has washed out and this will leave their staff vulnerable and not safe on the job, you will also end up with an unhappy customer having to replace the products more frequently. Check the data sheets, any good quality manufacturer will have tested these points and will provide you with the data to pass on. You have to explain to the customer that in most cases you are not quoting like for like products when your items come in more expensive. My father, Keith Burton who started our company, would never sell a cheap unbranded product. He would always cite, ‘we are the Marks and Spencer of the industry’ back then, not sure that would work these days, but you get the idea of where he was coming from! If they want like for like, then as long as they know what they are getting, then that’s fine with me. To succeed in this business, you need to know your products well, see the reps who come in, look at the new materials being used, the new technologies, ask them the target industry, know your customers. We are always thinking about our customer database and if we see a new item that might suit someone we know we will use that as an excuse to get in touch with them, tell them about it and sell it. Ask the manufacturers what products they would use to print a logo on to, what process do they recommend, they are the manufacturers after all, they should know. If not, speak to your print supplier, they can always offer great advice. If there is one thing I have learnt it is that showing enthusiasm for your industry, passion for your business and your knowledge of your products and manufacturers to your customers will ensure you win over price, every day of the week.